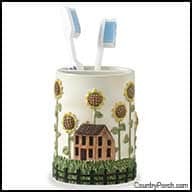 The Country Porch features the House and Sunflower of bathroom decorating accessories from Park Designs. Designed by artist Teresa Kogut, resin bath accessories coordinate with terry bath towels. Machine wash cold, tumble dry. 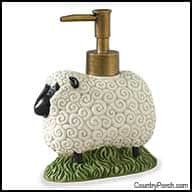 Pair with our extensive selection of shower curtains and bath hardware.